Your keiki's comfort is my goal! My children’s rental equipment is easy to reserve, obtain, and return. I make it a point to make the process of renting baby gear in Kauai as stress-free as possible, so you can spend more time enjoying your vacation and less time worrying about your rentals. Choose your equipment from my inventory and the select number of days you would like to reserve each item. Please enter delivery and pick up dates on order form during check out. Pay for your order in my secure online payment processing shopping cart. Once I receive payment, I will email you a confirmation of your booking. Your rental equipment will be delivered to your vacation rental either the day prior, or the day of your arrival. Arrangements will be confirmed with your vacation rental manager/front desk. You may need to give consent for delivery. 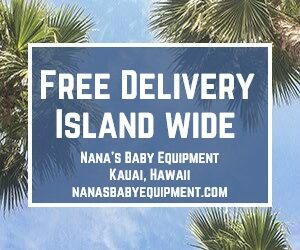 Delivery is FREE island wide! I will contact you two days before your departure date to arrange for pick up. I require 72-hour notice of cancellation. If equipment reservation is canceled less than 72 hours, I charge a fee of 50% of the total equipment charge. The balance will be refunded to your credit card you used to place your order within 7 business days.